Trying to diagnose the cause of browning leaves on a fruit tree can be difficult. This is a guide about brown leaves on a loquat tree. I have a loquat tree and the leaves are brown and rusty. What am I doing wrong? How cool that you are growing a loquat tree. We don't see them in PA.
Any time I have simple issues with plants, I either talk to my local Home Depot/Lowe's garden person. If you catch them in a slower time they are very helpful. For the tough questions, see if one of the local colleges in your area offers agriculture classes and see if the teacher can have the students help. It is good practice for them. Many of the leaves on my 3 yr. old loquat tree are turning brown suddenly. There are brown spots, brown edges, and the younger leaves are totally brown. What's going on? Is this a December thing? It has not blossomed one time yet and, of course, no fruiting yet. Help. I have a small loquat tree and it has brown rusty leaves. What is going on? Our mature locquat tree has adequate water and the leaves are turning brown, primarily from the top of the tree and towards the middle of the tree. What is the cause of this problem and what should I do? Check with your local county extension office; they have master gardeners there who can probably quickly identify the problem for you and tell you what to do. These folks are a FANTASTIC resource! Q:I have a young (3') Loquat Tree planted in my backyard. Its leaves are turning dry and brown despite sufficient watering, and may have some "munch markings" on the edges. I have 2 other Loquats in my front yard receiving similar sun, shade, and water and they are doing fine. Might something be munching on my tree, and if so, what can I treat it with to stop it? Loquats don't have that many natural pests, but they are sometimes susceptible to scale and fire blight. Does your tree have blossoms yet? 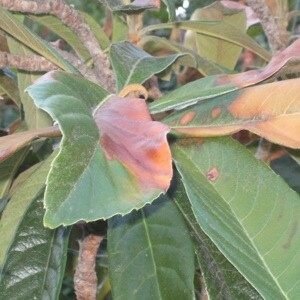 Fire blight, caused by the bacterium Erwina amylovaora, is common to your area. It usually occurs in the early spring during warm, humid weather. It is characterized by flowers, twigs and foliage that have a blackened or burned appearance. The tips of affected twigs and shoots may also droop into the shape of a "Shepard's crook." Cankers (dark or discolored areas) on the bark can usually be seen on the trunk or on branches near affected tissues and sometimes have an amber-colored discharge oozing out of them. I would cut off a few of the affected branches and take them to your county extension agency or call your city arborist. 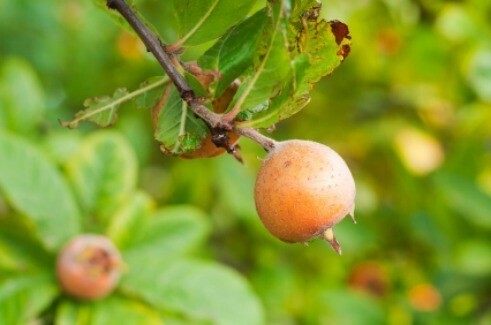 If it is fire blight, you'll need to remove all the affected root sprouts and suckers from the tree as soon as possible to prevent further spread of the disease. Dear Tripleb, I'm from Montgomery ! Lol small world huh? I'm now living far away. Anyhow, I have no clue what's up with your tree. However try calling your county agent. The # will be in the phone book under agriculture. Hope they can help. I have a 3 year old loquat tree about 8ft tall in my backyard. It does not have flower/fruit yet. It was really healthy in the past 3 years. But it has gray-brown spot on its leaves, especially the younger leaves since last week; and the amount of spots has been rapidly growing on more leaves. Is my loquat tree suffering some kind of serious disease? What can I do to stop the disease and save my tree? Help please!